Mogo is one of our best selling brands and at our Grand Opening Event we will be launching Mogo's new and exciting product! No little Mogo fan or fan in the making will want to miss this!!! 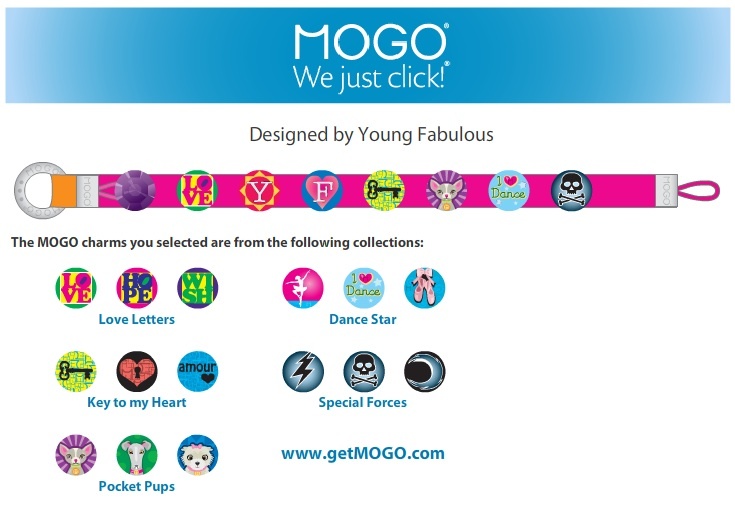 AND the first 30 to PURCHASE THE NEW MOGO PRODUCT will GET A FREE HEART CHARM! Young Fabulous currently stocks the Mogo Charmband, Mogo Charm Tins, Mogo Singles and Mogo Birthstones. will be joining Young Fabulous Children's Boutique on Grand Opening Day from 9:30am - 5:00pm. Bring in your little girl for a complimentary polish and design! This is on a first come, first serve basis so hurry in! THE DANCE BARRE'S DANCING FASHION SHOW! THE DANCE BARRE'S COMPETITIVE DANCE TEAM will be joining Young Fabulous Children's Boutique on GRAND OPENING DAY APRIL 16TH. They'll be doing performance Fashion Shows starting at 1:00pm and again throughout the afternoon. This will be FAB-U-LOUS!!!! OUTDOOR MINI-SESSION BY ELENI PHOTOGRAHY! Book ahead for a Short and Sweet Outdoor Mini-Session by Eleni Photography! Eleni will be joining us Grand Opening Day. She is an expert in outdoor photography and has already scouted out our location. She is prepared to take Fabulous photos of your children outside on our premises, on April 16th. And in celebration of our Grand Opening Eleni is offering our customers a Fabulous deal if they purchase an outfit ($100+) from Young Fabulous anytime between April 11th - 16th: Eleni will shoot your Mini Session at a reduced price plus you'll receive a complimentary 8x10 photo in addition to the 11x16 mounted photo! 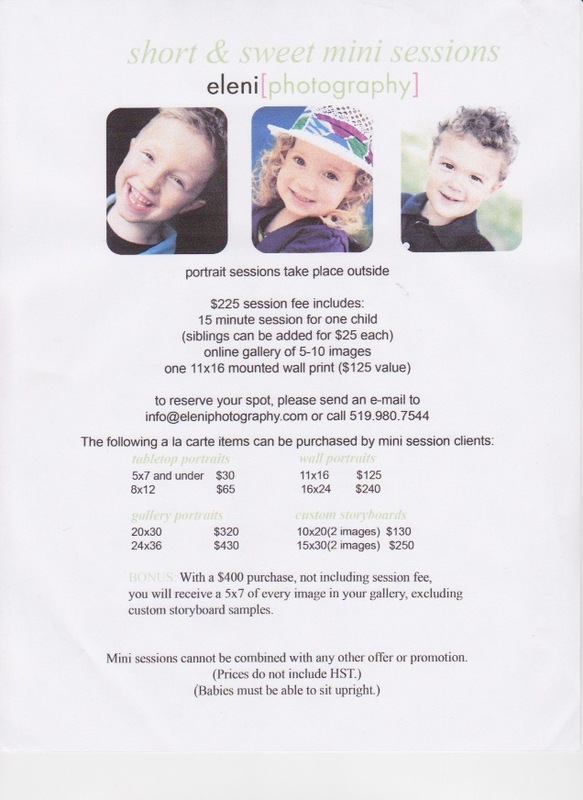 This is such a Fabulous opportunity to get photos of your child. The timing is perfect for Easter. Combine this opportunity with the Community Clothing Centre Drive (to receive 20% off), Estetica (for Fab nails) and the fun day (for Fab memories)! To find out more about Eleni go to www.eleniphotography.com. DENIM AND DRESS DRIVE FROM APRIL 11 - APRIL16th! From April 11th - April 16th Young Fabulous is collecting gently used jeans and dresses in exchange for 20% off on new jeans and dresses! All collections will be donated to the local Community Clothing Centre, a Fabulous charity that supports local families who can't afford to purchase new clothing. Families who shop at the Community Clothing Centre have to be referred and get to shop for Free! *Come in with your daughters gently used dress from last year. Get 20% off her new dress. Have Estetica Lil' Princess Spa apply a complimentary polish with design! Now she's ready to have her Easter photos taken in the natural daylight with Eleni Photography (which you booked ahead, of course!). All the while you've donated a dress to a girl in need and you've had a blast with us! FOOD, DRINKS, FUN, DISCOUNTS & RAFFLES! We'll have complimentary food and drinks all day, 3 televisions set up with XBox video games, 1 television set up with children's programming, an art table for children (Time to work on their Mini&Maximus Art Submissions!) , special discounts and raffles! Please join us and tell all your friends to join us for this Fabulous Grand Opening Event!